Where did the summer go? We’re already fast approaching autumn – bad news for fans of sunshine and tennis, but good news for us tabletop gamers as shows like this month’s Gen Con and October’s Essen prepare to reveal the games we have to look forwards to for the next year. 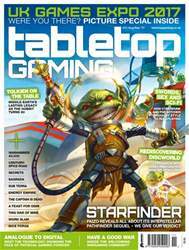 In fact, Gen Con’s brightest star is our cover feature this week: Paizo’s sci-fi follow-up to legendary RPG Pathfinder, Starfinder. To celebrate the massive launch, we’ve not only got an exclusive interview with the game’s creative director on page 22, but you can also hear what we think in our review over on page 76. That’s far from all this issue, as we’re also taking the time to celebrate the tabletop legacy of two of the greatest fantasy worlds ever to make the page: J.R.R. Tolkien’s land of Middle-earth, which turns 80 years old this year, and Sir Terry Pratchett’s Discworld, which is being marked with a new 20th anniversary edition of its classic 1990s RPG. Elsewhere, we speak with Cyberpunk creator Mike Pondsmith and his son Cody about their work on the influential ‘80s RPG and the upcoming tabletop adaptation of the Witcher video games. Plus, we’ve rounded up the best of this year’s UK Games Expo – the biggest yet! Happy gaming!